In my previous post here I showed the mug tree our grandchildren helped create in the garden ready for our NGS open gardens. The mugs were a collection from them, their friends and some we had. My favourite was the one below, (I don’t know why), but it does amuse me. 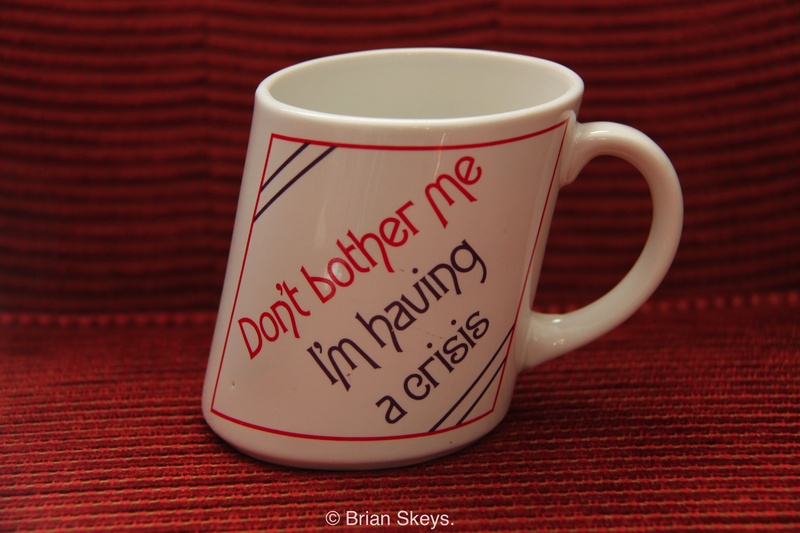 More mugs can be viewed by going to Photography at the top of the header page and clicking on Mug Shots. I used to have one at work when I was teaching, bought by my sister. I was away for a week on a residential visit with my class and when I returned someone had broken it. Apparently the breaker tried to buy a replacement but it was fairly unique and they couldn’t find a replacement so had to confess. A good dentist is worth looking after Amy. I was once given a mug at work emblazoned with the text “I drink too much coffee”. It had one flaw, though – a hole in the bottom! A bit like the bucket in the song! Oh, I do like the wonky mug, Brian. My favourite mug, which I cherish as a pen holder, is twenty five years old, it was given to me by a favourite group of foreign HE students. I have a rolling series of favourite mugs which inevitably get broken. The most recent crashed into the Belfast sink last week (it’s a hazard) so I am currently sipping from second favourite plain blue Le Creuset mug. I like a mug that keeps warm for ages; that’s my main criterion! If you drop that one would it crack the Belfast sink? Definitely need favourite mugs – right size, right shape, right colour/pattern, and different for tea/coffee of course! It has to be fine china for tea and chunky for coffee Cathy.